Fritz Beng Tambi Tabe has been a skilled grill chef for over two years here in Richmond but he has only recently been recognized on the international stage at a competition in Sydney, Australia. Nando’s at Central at Garden City, on Alderbridge Way in Richmond, now has an international Master Griller. 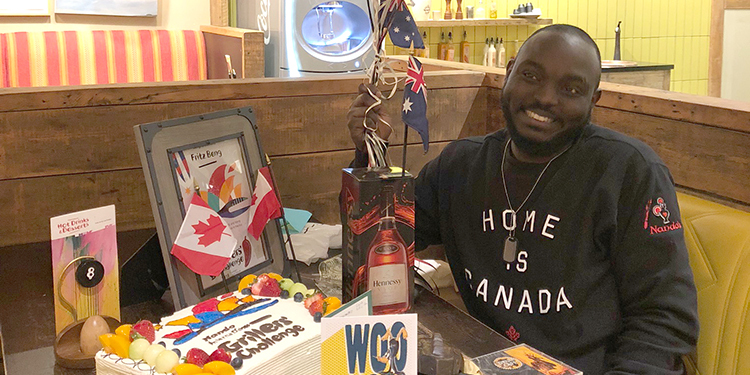 It turns out, unbeknownst to many of us, Fritz Beng Tambi Tabe has been a skilled grill chef for over two years here in Richmond but he has only recently been recognized on the international stage at a competition in Sydney, Australia. Out of 23 national teams, the local Nando’s grill chef, known to all as Fritz, came in third in the October 2018 competition with his version of PERi-PERi flame-grilled chicken. In recognition, his bosses surprised Fritz with an African band at work. And how does he feel about his employer?